Unhappily married Scott Henderson (Alan Curtis) is arrested for the murder of his wife. Scott's devoted secretary Carol (Ella Raines) is determined to clear her boss, but in order to do so she must find his mysterious alibi, the PHANTOM LADY. Unfortunately, strange things keep happening to anyone who might have seen the title character. Resourceful Carol is aided by a police inspector (Thomas Gomez) who has doubts about Scott's guilt. She is also aided by Scott's best friend Jack (top-billed Franchot Tone), but from the time Jack enters the story, 50 minutes into the movie, the viewer knows that Jack is not exactly who he seems. PHANTOM LADY is a relatively little-known but absolutely wonderful film noir which is filled with rainy streets, shadows on walls, and a gallery of creepy, disreputable characters. The film is very visually striking, including some terrific sets, and is a must-see for fans of the genre. There are several notable things about the film, such as the unique way a murder trial is depicted, using simply voices, closeups of a court reporter's shorthand notes, and reaction shots of Carol's face. Another sequence in which Elisha Cook Jr. plays the drums, is, er, strangely suggestive. (Leonard Maltin rumors in his 3-1/2 star review that it was dubbed by Buddy Rich.) It's amazing what can be conveyed without showing an inch of skin. The film runs a taut 87 minutes. Carrie at Classic Montgomery mentioned that yesterday was the anniversary of Franchot Tone's birth, so it seems apropos to have watched one of his movies this weekend. Tone spent much of his career as a genial leading man or friend of the hero, receiving a Best Actor Oscar nomination for one such role (MUTINY ON THE BOUNTY), and his part as the unbalanced Scott is quite different from the many other films in which I've seen him. I used to think of Tone as rather bland, but have developed a great appreciation for his work over the last couple years and look forward to seeing more of his films. Alan Curtis -- previously seen in the mid-'30s comedies SMARTEST GIRL IN TOWN and WALKING ON AIR -- is fine as the hapless murder suspect. The supporting cast includes Regis Toomey (a rather uncharacteristic role as a seemingly vacant-headed, gum-chewing police detective), Aurora Miranda (sister of Carmen), Fay Helm, Doris Lloyd, Virginia Brissac, and Victoria Horne. PHANTOM LADY was directed by Robert Siodmak, who made a number of interesting thrillers, including CHRISTMAS HOLIDAY (1944), THE SPIRAL STAIRCASE (1945), THE KILLERS (1946), CRY OF THE CITY (1948), and CRISS CROSS (1949). You can read more about PHANTOM LADY in this entry posted by Steve-O at Noir of the Week. The movie is based on a story by Cornell Woolrich (REAR WINDOW). PHANTOM LADY does not yet appear to have had a Region 1 DVD release, but it was released in a beautiful VHS print. September 2009 Update: Thanks to Tim Coleman for writing and sharing the info he recently learned that it was his dad, Dave Coleman, who dubbed the drum solo. April 2012 Update: I had another great experience seeing this film as part of a Cornell Woolrich trilogy at the Noir City Film Festival. 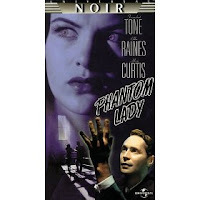 December 2012 Update: PHANTOM LADY is now available on DVD from the TCM Vault Collection. THE DESPERADOES is a very enjoyable Western starring two excellent leading men, Randolph Scott and Glenn Ford. The movie also has some nice production values and a light, often humorous storyline which makes for agreeable viewing. Handsome Ford plays Cheyenne Rogers, a gunslinger who decides it's time to reform when he rides into a Utah town of the 1860s and meets pretty Alison (Evelyn Keyes). Fortunately for Rogers, the sheriff (Randolph Scott) is an old friend. Cheyenne and the sheriff get each other out of multiple jams while solving a recent bank robbery. Cheyenne is also aided by the town's "bad" woman (Claire Trevor), who's another old friend, and a genial if none-too-smart pyromaniac named Nitro (Guinn "Big Boy" Williams). That's about all there is to the film's 87 minutes. The movie features some lovely Technicolor location shooting near Kanab, Utah; a couple Internet sources say that this was Columbia's first Technicolor movie. Some of the location shots clearly use doubles but there are other location scenes featuring the principal cast members. The cast, the colorful setting, and some action, romance, and humor all add up to a nice way to spend a Friday evening. The fiery Ford was clearly on his way to stardom in this film. Scott is a genial presence but it's Ford who has the movie's love story and perhaps a little more screen time. Ford and Keyes were frequent costars during the '40s. Their film THE MATING OF MILLIE (1948) is a movie I particularly liked which frequently aired on TV when I was growing up; now my daughter loves it too. THE DESPERADOES was directed by Charles Vidor. The year after THE DESPERADOES was released, Vidor married the film's leading lady Evelyn Keyes, but the marriage only lasted a little over a year. Vidor, incidentally, directed Ford in his classic film GILDA (1946), costarring Rita Hayworth. The supporting cast includes Edgar Buchanan, Porter Hall, Raymond Walburn, Irving Bacon, Bernard Nedell, Glenn Strange, and Slim Whitaker. 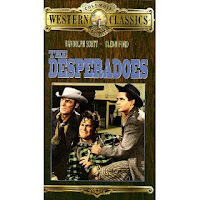 THE DESPERADOES has been released on both DVD and VHS. 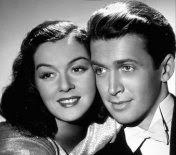 NO TIME FOR COMEDY, which stars James Stewart and Rosalind Russell, suffers from a split personality which curiously mirrors the film's plot. The first third of the movie, in which a small-town playwright (Stewart) arrives on Broadway and falls in love with his play's leading lady (Russell), is a fun romantic comedy. Stewart and Russell have a charming chemistry, and her delight in Stewart is particularly winning. Just as the viewer has settled in for a pleasant time, the movie plot jumps forward four years and makes a 360-degree turn. The playwright has now had several hit comedies, but has a habit of wandering New York drinking in search of "inspiration" in between plays, and he is easily led further astray by a wealthy woman (Genevieve Tobin) who encourages him to write something "serious." Meanwhile, the actress wife suffers nobly, waiting for the playwright to come to his senses. Just as Jimmy Stewart's character decides to become serious, so does the movie, which shifts from lighthearted romance to a drama with some brittle, witty dialogue smattered here and there. The good lines in the last hour are usually uttered by Charlie Ruggles, playing Tobin's long-suffering stockbroker husband. The last hour of the movie continues to be interesting, but it's not nearly as much fun as it was when it started out. When the film abruptly comes to a too-easy happy ending after 93 minutes, the viewer is left feeling a bit baffled. Stewart plays one of his least likeable characters, and although I'm a big Stewart fan, I have to say it's probably just as well he disappears for long periods of time as his character wanders New York. Russell is beautiful and sympathetic as the almost impossibly calm and understanding wife. The film is buoyed by the performances of Ruggles and Louise Beavers, who has a large role as Russell's outspoken maid and sometime acting colleague. Beavers' part struck me as a bit unique for a black actress in its era; although she was a maid, she was still on an equal footing with Russell as her co-actor and confidante who never hesitates to give Stewart a hard time. The scene where Russell and Beavers pass the pages of Stewart's "serious" script back and forth while critiquing it illustrates this aspect of their relationship and is one of the better moments in the last hour of the movie. Allyn Joslyn, who always makes a movie better, is also along for the ride as Russell's exasperated director and friend. Tobin is appropriately daffy and, for that matter, she sounds just like Billie Burke, who often played similar roles. 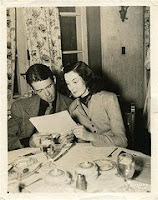 Tobin had married the movie's director, William Keighley, in 1938. NO TIME FOR COMEDY was based on a 1939 play which starred Katharine Cornell and Laurence Olivier. Curiously, although Stewart and Russell were MGM stars throughout the '30s, they made this film for Warner Bros.
NO TIME FOR COMEDY has not had a video or DVD release. It can be seen on Turner Classic Movies, which has the trailer available at the TCM website here. A side note: TCM listed the film on its schedule as NO TIME FOR COMEDY, but the title card for the print they aired used the film's alternate title, GUY WITH A GRIN. 2013 Update: NO TIME FOR COMEDY is now available on DVD in a remastered print from the Warner Archive. Deanna Durbin Singing "Nessun Dorma"
Not much time for blogging today, due to a heavy work schedule, but I thought I'd leave a little pick-me-up posted here. If you love Deanna Durbin, click the title of this post for a YouTube clip of her lovely rendition of Puccini's "Nessun Dorma" from TURANDOT. It runs about 3-1/2 minutes. This is the finale of HIS BUTLER'S SISTER (reviewed here) and is probably my all-time favorite scene from the many wonderful Durbin movies I've seen to date. Among those listening to Deanna singing are Franchot Tone and Pat O'Brien. 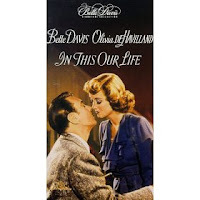 IN THIS OUR LIFE is a delicious soap opera wallow, filmed in glorious black and white, which provides the chance to enjoy four Warner Bros. stars at their peak: Bette Davis, Olivia DeHavilland, George Brent, and Dennis Morgan. Davis plays one of her all-time bad girl roles as Stanley Timberlake. As the movie opens, Stanley is preparing to ditch her fiance (Brent) and run off with the husband (Morgan) of her sister Roy (DeHavilland). And that's just for starters. (They never do explain how Stanley and Roy ended up with boys' names, incidentally.) Disaster trails Stanley wherever she goes, from her first scene to her last...and as for her relationship with her Uncle William (Charles Coburn)...yikes! It was awfully suggestive for 1942. It's quite a dark movie, but it's also riveting. The actors are all tops, with Davis chewing up the scenery and DeHavilland holding her own with a much different, quietly forceful performance. As the film progresses, the viewer comes to realize that it's DeHavilland's mousier sister who is actually the strong woman, while Davis's whirlwind gradually falls to pieces. Brent -- who costarred with Davis in countless films -- and Morgan are excellent in support. Morgan is often associated with comedies and musicals, but he also appeared in some darker fare, such as 1943's THE HARD WAY, another movie in the hard-edged Warner dramatic style. He's quite good in this as the tormented surgeon who makes some very bad choices. The supporting cast also includes Frank Craven, Billie Burke, Lee Patrick, and Hattie McDaniel. The film has a socially conscious streak mixed in with the soap opera, as DeHavilland and Brent help a young black man who aspires to be a lawyer. According to the Turner Classic Movies site, the actor, Ernest Anderson, was a waiter in the studio restaurant who was recommended to director John Huston by Davis. He gives a very fine, dignified performance. Anderson acted off and on until 1978. IN THIS OUR LIFE calls to mind Davis's great classic from the previous year, the William Wyler film THE LITTLE FOXES, another story about a disturbed Southern family. Particularly in the early scenes, Ernest Haller's cinematography for IN THIS OUR LIFE at times is reminiscent of the unusual upward angles used by Gregg Toland in THE LITTLE FOXES. It would be interesting to know if this was deliberate or a coincidence. This was the second directing credit for John Huston, following his triumph with THE MALTESE FALCON. He cast his father Walter in a cameo role as a bartender; although he's only in one scene, his character ultimately holds the key to Bette Davis's fate. A fun John Huston anecdote: when my school choir was at LAX in the late '70s, preparing to leave for a two-week tour of Mexico, my mother and the Spanish teacher accompanying our choir spotted Mr. Huston in the airport. The teacher had previously met Mr. Huston in Mexico, and she and my mother went over to say hello to him. They obtained his autograph for me, which, needless to say, I have to this day. IN THIS OUR LIFE is based on a novel by Ellen Glasgow. It runs 97 minutes. The dramatic score is by Max Steiner. The film is available in a beautiful DVD print as part of the Bette Davis Collection, Volume 3. Extras include a commentary track by Jeanine Basinger; I haven't heard it yet but my dad has recommended it as being especially good. IN THIS OUR LIFE has also been released on VHS. It can be seen on Turner Classic Movies; TCM has the trailer available here. June 2017 Update: IN THIS OUR LIFE has been reissued on DVD by the Warner Archive. A 50th Anniversary Edition of PILLOW TALK, starring Doris Day and Rock Hudson, will be released on April 14, 2009. PILLOW TALK has previously been released without extras, other than the trailer. According to DVD Times, extras for the 50th Anniversary release will include featurettes and a commentary track by Jeff Bond, Julie Kirgo, and Nick Redman. I do wish Universal would release more titles from their library, instead of releasing the same movies over and over, but on the other hand I'm delighted to see one of Doris Day and Rock Hudson's best movies receive a nice upgrade. Over at Big Hollywood, Burt Prelutsky published a list of his favorite -- not necessarily "the best" -- movies, decade by decade. It's always fun to see what appeals to fellow film fans. It was an enjoyable list. I've seen a majority of the titles listed through the '60s, and many of the movies he mentions from later decades, as well. I was intrigued by his inclusion of Jeanne Crain's APARTMENT FOR PEGGY (1948), which I commented last October is a film which deserves wider recognition. He also lists two of my top three favorite movies, SEVEN BRIDES FOR SEVEN BROTHERS (1954) and MEET ME IN ST. LOUIS (1944). I was also delighted to see the recognition for one of James Garner's very best movies, SUPPORT YOUR LOCAL SHERIFF! (1969). Prelutsky must be a Garner fan, as he also lists 36 HOURS and MURPHY'S ROMANCE. Newer movies which make his list include SENSE AND SENSIBILITY (1995) and GROUNDHOG DAY (1993). A few of my favorites which didn't make his list: THE ADVENTURES OF ROBIN HOOD (1938), THE MARK OF ZORRO (1940), YOU WERE NEVER LOVELIER (1942), SHE WORE A YELLOW RIBBON (1949), THE QUIET MAN (1952), WHITE CHRISTMAS (1954), MARY POPPINS (1964), and THE SOUND OF MUSIC (1965), which is the third film on my own "Top 3" favorite movies list. Newer titles I would include among my favorites: THE LAST OF THE MOHICANS (1992), EMMA (1996 Paltrow version), and YOU'VE GOT MAIL (1998). 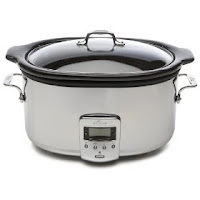 The L.A. Times Food section has a fun article today on how slow cookers and their uses have evolved since the '70s. A side article reviews several models, if you're in the market for your own. As I wrote earlier this month, at Christmas I made the jump from a mid-'80s 4-quart Rival model to a 6.5-quart All-Clad, which is large enough for me to make bigger recipes, such as roast chicken. (It's not the model reviewed by the Times; mine has a ceramic insert which doesn't get too hot.) While I thought I would store my smaller Rival until one of my children needs it, I'm finding that having two different sizes and shapes might be useful, for a variety of reasons -- a point mentioned in the article. Tonight's dinner is Old-Fashioned Pot Roast from THE GOURMET SLOW COOKER, VOLUME II. I have cut back somewhat on my political commentary, as there are so many negative things I could post on a daily basis that it becomes overwhelming. At this particular point, I'd rather focus mainly on positives. He somehow seems to think he can promise everything and charge the majority of the American public nothing. We all know this is an impossibility. The rhetoric about spending responsibly leaves one speechless after Congress and the President just agreed to the most irresponsibly massive financial boondoggle in our nation's history. And then he reassures us that V.P. Biden will be watching the spending and "No one messes with Joe"? That would be the same Joe who went on TV today not knowing the "website number" of recovery.org. In the words of Power Line's Scott Johnson, Obama's "day of reckoning awaits." 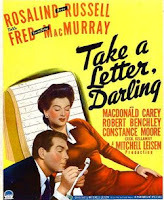 TAKE A LETTER, DARLING is a delightful comedy starring Rosalind Russell and Fred MacMurray. Russell plays an advertising executive who hires MacMurray as her secretary. As one might expect, complications ensue, romantic and otherwise. 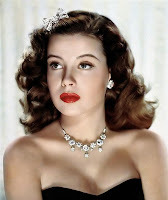 Russell was always wonderful in her career girl roles, and underneath the lazy charm MacMurray has a steely spine which is very appealing. Together they make an excellent team. Macdonald Carey, in his film debut, plays a much-married millionaire who is reluctant to do business with a woman. Thanks to a mustache, Carey looks quite a bit older than he did when he appeared the following year as the young FBI agent in Hitchcock's SHADOW OF A DOUBT. Constance Moore plays Carey's sister, who has her eye on MacMurray. Robert Benchley is excellent as Russell's partner, who spends all his time in his office playing games. I like Benchley most in his more subdued roles, and this is one of his best; I would have enjoyed it if he'd had even more screen time. The supporting cast also includes Cecil Kellaway and Dooley Wilson. Kellaway appeared in a much larger role in I MARRIED A WITCH the same year this film was released; Benchley also had a role in that fantasy classic. And of course, 1942 was also a good year for Dooley Wilson, who played Sam in CASABLANCA. Karin Booth is credited with a bit role as a stenographer. Booth spent the first half of the '40s in bit parts before landing some featured and leading lady roles at MGM and elsewhere in the late '40s and early '50s. 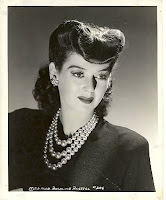 Booth's most notable role was as La Darina, the ballerina Margaret O'Brien plots against in THE UNFINISHED DANCE (1947). The film was directed by Mitchell Leisen, who had previously teamed with MacMurray on HANDS ACROSS THE TABLE (1935) and REMEMBER THE NIGHT (1940). Leisen had a marvelous touch with comedy, directing classics such as EASY LIVING (1937) and MIDNIGHT (1939), as well as the fun film THE MATING SEASON (1951). While TAKE A LETTER, DARLING isn't on a par with Leisen's very best work, it's quite witty and enjoyable. This movie runs 92 minutes and was shot in black and white. TAKE A LETTER, DARLING has been shown on cable on TCM. It has not been released on video or DVD. Great news for John Wayne fans: two of his '60s Western classics are coming to DVD in Special Editions on May 19, 2009. THE MAN WHO SHOT LIBERTY VALANCE (1962) and EL DORADO (1966) have been previously released without any extras other than trailers. They are now being released in Paramount's Centennial Collection. THE MAN WHO SHOT LIBERTY VALANCE, directed by John Ford, will have a Peter Bogdanovich commentary and a second "scene-specific" commentary with Dan Ford and archival recordings. There will also be a featurette and photo galleries. Howard Hawks' EL DORADO will have two separate commentary tracks, one with Bogdanovich and one with Richard Schickel and others. Bogdanovich and Schickel's commentary work over the years has been uneven, but they'll be worth checking out. Other extras include a vintage featurette as well as new featurettes. May seems to be the favored time of year to release Westerns -- just in time for Father's Day! -- so perhaps there will be more good news on upcoming Western releases in the near future. I didn't watch the Oscars, other than this year's memorial tribute. It's a nice piece set to Queen Latifah singing "I'll Be Seeing You," and it's very moving to take another look at all the greats who left us last year, including Widmark, Heston, Johnson, Montalban, and Newman. If you'd like to watch it, click on the title of this post for the YouTube link. 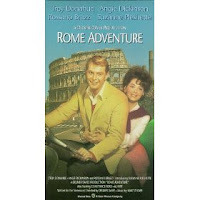 ROME ADVENTURE has two beautiful assets: lovely young Suzanne Pleshette and the many sights of Italy. 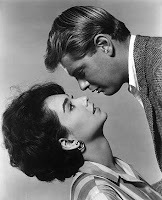 The film has three main drawbacks: drippy '60s pop music which seems to have been recorded in an echo chamber, a fair amount of obviously "looped" dialogue, and the incredibly wooden Troy Donahue. Some of the dialogue looping was likely due to all the exterior location filming, but there were a couple spots where I wondered if they were simply trying to coax more energetic line readings out of Donahue. The delightful Pleshette makes up for Donahue's performance, especially as she's onscreen a majority of the movie's running time, and the film has an excellent supporting cast: charming Rossano Brazzi as an older man about town with a yen for Prudence; Constance Ford (A SUMMER PLACE) as Prudence's employer; and Angie Dickinson as Don's former love, a bad, bad girl who tries to come between Don and Prudence. Angie is seen briefly near the start of the movie, and when she reappears in the last half hour she definitely kicks the film's energy level up a notch. This movie would make a fun double bill paired with THREE COINS IN THE FOUNTAIN (1954), another film featuring both beautiful Italian locations and Rossano Brazzi. You can read more thoughts on ROME ADVENTURE at Raquelle's blog, Out of the Past. ROME ADVENTURE runs 119 minutes and was written and directed by Delmer Daves. ROME ADVENTURE is also available on VHS. Update: I had a feeling when I was watching the movie that the "American Bookstore" where Prudence works was "Marian the Librarian's" library from THE MUSIC MAN, released by the same studio the same year. According to IMDb, my guess was correct, it's the same set. A fun piece of trivia. In the last few weeks I've used Christmas gift cards to add several new titles to my cookbook collection. I've enjoyed all of them very much. 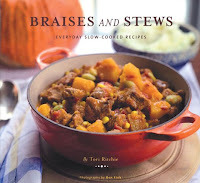 BRAISES AND STEWS, a 2007 book by Tori Ritchie (click title of post), provided tonight's dinner: Beef Stew with Caramelized Onions and Red Wine. It was superb! Next on my list to make from this book is Braised Brisket. 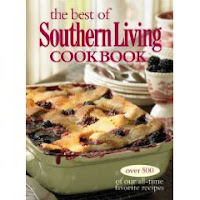 THE BEST OF SOUTHERN LIVING COOKBOOK provided an excellent recipe for Peppered Ribeye Steaks for President's Day weekend. Later this week, once the current rain has passed, we plan to grill Rosemary Chicken. This book is brand-new, just published in early January. 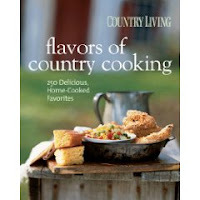 FLAVORS OF COUNTRY COOKING is from the editors of COUNTRY LIVING magazine and was first published in 2004. So far my favorite recipe from this book is Herb Popovers. The popovers are flavored with herbes de Provence which gives them a faintly sweet taste we really liked. 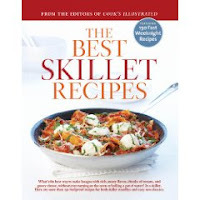 Cook's Illustrated has a new book coming out next week, THE BEST SKILLET RECIPES. Cookbooks from Cook's Illustrated and their America's Test Kitchen are always good, so I'll be taking a look at it when it's released. 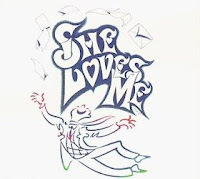 SHE LOVES ME has long been one of my very favorite musicals, and the first time I ever saw it was a 1978 British TV production which aired in the U.S. on public television. The production starred Robin Ellis (then a major TV star playing the title role in POLDARK) and Gemma Craven (Cinderella in THE SLIPPER AND THE ROSE). I've been fortunate to see the show on stage in the intervening years -- a marvelous production starring Joel Higgins (SILVER SPOONS) and Pam Dawber (MORK AND MINDY), who were both accomplished musical theater actors -- but I've been hoping for all these years to see the TV production again. Thanks to the kindness of a fellow SHE LOVES ME fan, I finally had the opportunity to watch it again, and I thoroughly enjoyed it. SHE LOVES ME is the classic SHOP AROUND THE CORNER/IN THE GOOD OLD SUMMERTIME/YOU'VE GOT MAIL plot about two squabbling coworkers who are unknowingly carrying on a romantic correspondence. It has a wonderful Bock-Harnick score which includes "Dear Friend," "Ice Cream," and the title song. The videotaped British production is presented almost as though one were seeing a stage production from a close angle. The sets look very much like what one would see if watching it on the stage, and as in a real theatrical production, chorus members appear in different roles throughout the musical. Ellis and Craven are excellent in the lead roles. I remember what a delight it was to discover that "Ross Poldark" could sing! The excellent supporting cast members include Diane Langton as Ilona, Peter Sallis (WALLIS AND GROMIT) as Sipos, and David Kernan as the oily Kodaly, a role originated on Broadway by Jack Cassidy. Kernan was nominated for a Tony Award for SIDE BY SIDE BY SONDHEIM the year prior to filming SHE LOVES ME. My one criticism is the BBC's sound engineering, which tends to make the singers sound as though they're shouting at times; a bit more nuance and variation would have been nice. However, I suspect that technically this was probably as good as it gets for the BBC in the '70s. The show runs 105 minutes and was directed by Michael Simpson. For those who have missed becoming acquainted with this wonderful musical, I highly recommend the original Broadway cast CD starring Barbara Cook and Daniel Massey. CDs are also available of the 1993 and 1994 Broadway and London revivals. SHE LOVES ME is not out on DVD, but hopefully it will be one day... In the meantime, if you're willing to watch a rather blurred print with good sound, it can be seen in 11 sections on YouTube, with Part 1 available here. After our quick visit to Disney's California Adventure this afternoon, we moved over to Disneyland. 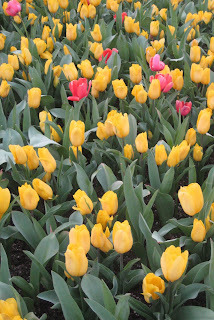 As always, the flowers at Town Square were gorgeous! It's a Small World recently reopened after renovations which took most of 2008. 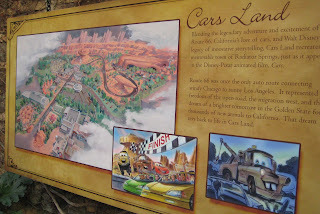 The refurbished ride included controversial changes, the insertion of Disney characters, created in the style of Small World artist Mary Blair, in appropriate lands. Our overall verdict? We rather liked it and thought the Disney characters were appropriate, especially as they were designed to match Mary Blair's style. However, I didn't particularly care for the new soundtrack, which includes adult choral vocals at one point in the arrangement, backing up the traditional children's chorus singing "It's a Small World." The inclusion of adult voices is very out of place in the ride, and I believe they should re-think it. We haven't been to the Disneyland Resort since Christmas, due in part to rainy weather and winter illnesses circulating through our family. This afternoon we made a brief impromptu visit to both California Adventure and Disneyland to see a couple of new-to-us attractions. One more year to wait for the World of Color! I'm thrilled with all the coming changes -- although I do wish there were a way to preserve Pizza Oom Mow Mow, which has a wonderfully detailed '60s surfing theme and is one of our favorite places to eat lunch. It's going to be replaced with a restaurant more in keeping with the new early 1900s theming of Paradise Pier. I'm delighted that current Disney management has been so willing to admit the shortcomings in the park's original design and invest in making it a truly spectacular Disney theme park. 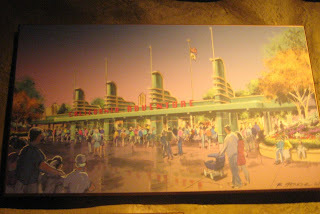 Previous posts on the California Adventure renovations: October 16, 17, and 18, 2007; January 8, 2008; February 11, 2008. Photos from the Disneyland part of today's visit are posted above. Beth Krush, who with her husband Joe illustrated classic children's literature including Mary Norton's THE BORROWERS, Virginia Sorenson's MIRACLES ON MAPLE HILL, and Beverly Cleary's SISTER OF THE BRIDE, has died at 90. I particularly liked her illustrations for Sydney Taylor's ALL-OF-A-KIND FAMILY DOWNTOWN and Elizabeth Enright's GONE-AWAY LAKE. Mrs. Krush is survived by her husband and illustrating partner, Joe. I liked Season One of the 1978 TV series THE PAPER CHASE much better than the 1973 movie of the same name. For the most part I think the TV actors and situations were more appealing and interesting than the movie, which I thought flopped between being dull and annoying. I never sympathized very much with the students in the film version. I was very sorry when CBS cancelled the series and am delighted it's going to be available on DVD three decades later. Who could have dreamed when it was cancelled that it would one day be available again to watch whenever we want? THE PAPER CHASE will be released on April 7, 2009. Nearly 18 months ago I posted an item regarding a film in production about Queen Victoria's early years. That movie, starring Emily Blunt in the title role, is now ready to open in the UK on March 6th. A United States release date does not yet appear to have been announced. The film also stars Rupert Friend as Prince Albert, Miranda Richardson as the Duchess of Kent, Paul Bettany as Lord Melbourne, and Julian Glover as Wellington. An appealing trailer can be seen at the bottom of this article on a YOUNG VICTORIA exhibit coming to Blenheim Palace. California Senate Republicans ousted their leader, Dave Cogdill, overnight. Cogdill had agreed to a budget with massive tax hikes. Cogdill was replaced with Dave Hollingsworth, an anti-tax conservative. Ed Morrissey at Hot Air: "I’d call that a statement. It certainly sends a message to party leadership that the California GOP will not willingly follow along with more tax increases in a state that already has become one of the worst for tax burdens in the nation. California did not get into its financial crisis through low taxes, and higher taxes won’t provide anything more than a Band-Aid on a gaping wound... California needs a real austerity program, one that sheds government workers and government programs. The Golden State also needs to stop borrowing money, which comes from the massive spending...higher taxes only provide a junkie’s fix to addiction." Keep in mind that the "cuts" proposed for the budget are merely political speak for not spending as much this year as they would have liked. There are no genuine deep cuts...and the politicians are planning to fill in many of the "cuts," such as they are, with federal "stimulus" money, while continuing to hang taxpayers out to dry for a budget which has increased over 40% in just half a decade. Needless to say, taxpayers' incomes and budgets haven't kept up that sort of pace. We'll know Democrats are serious about the budget when they start eliminating programs that are geared toward their key constituencies, such as offering "in state" college tuition rates to illegal aliens, while citizens from other states don't receive that financial break and must pay full price. Unfortunately there is concern that a couple of "moderate" GOP Senators who have thus far held out against the budget might be alienated by Cogdill's ouster and vote for the budget after all. Hopefully they will realize, in the words of Tony Strickland, "We need to stop treating the taxpayers across California like a personal ATM." Update: Via Patterico, here's a calculator from the Sacramento Bee so taxpayers can estimate the financial impact of the proposed tax increases. Thursday Update: Things did not end well for California taxpayers, thanks to a GOP "moderate" who was given a wish list of loony items including putting "open primaries" -- which voters have previously rejected -- on the ballot. 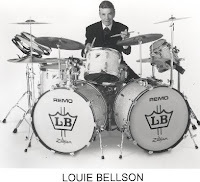 I grew up in a home where jazz was constant background music...I was saddened to read today that drummer Louie Bellson has died at the age of 84. The L.A. Times notes that Duke Ellington said that Bellson was "the world's greatest drummer" as well as "the world's greatest musician!" Bellson was married to Pearl Bailey from 1952 until her death in 1990. Bellson played with countless great musicians of the last century. You can read details about his career in the L.A. Times (click the title of this post) and at the Chicago Tribune. It's amazing what turned up under an old May Company parking lot in Los Angeles: "the largest known cache of fossils from the last ice age, an assemblage that has flabbergasted paleontologists." The recent excavation is expected to double the collection of the nearby Page Museum at the La Brea Tar Pits. Archaeologists carefully removed large quantities of dirt in intact sections so that it could be "excavated" slowly at another site while the land is used for construction of a new parking structure. A 75th Anniversary Edition of Cecil B. DeMille's CLEOPATRA comes to DVD on April 7, 2009. The movie stars Claudette Colbert in the title role, with Warren William as Julius Caesar and Henry Wilcoxon as Marc Antony. The cast also includes Joseph Schildkraut, Sir C. Aubrey Smith, Gertrude Michael, Ian Keith, and Irving Pichel, who spent his career alternating acting and directing. DVD Times lists the extensive extras, which include a commentary by F.X. Feeney, who also worked on the recent DVD release of QUO VADIS (1951). The set will also have a trailer and featurettes on Colbert, DeMille, and the Production Code Era; CLEOPATRA was released a few months after the Production Code went into effect in mid-1934. I don't recall ever seeing this film. It sounds like a great release, particularly for those of us who enjoy Claudette Colbert's work. I'LL GET BY may not be the greatest musical ever made -- in fact, you may not have even heard of it -- but from the opening shot of Harry James playing his trumpet, it provides terrific musical entertainment. I absolutely loved it. 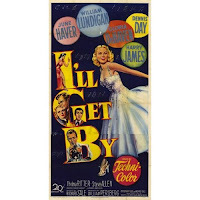 I'LL GET BY stars William Lundigan and Dennis Day as a pair of initially struggling music promoters and publishers, who fall in love with a team of singing sisters played by June Haver and Gloria DeHaven. The movie's fairly thin, pleasant plot is mainly an excuse for the great music. The movie is so jam-packed with songs that I doubt more than four minutes go by between any two songs. Some of my favorite musical moments included DeHaven and Day's "You Make Me Feel So Young" and the climactic "It's Been a Long, Long Time." The latter number is performed by the ladies in a USO show along with Dan Dailey in a cameo role. Jeanne Crain, Victor Mature, and Reginald Gardiner also play themselves. The terrific supporting cast includes Thelma Ritter and Steve Allen. The cast is simply delightful. Haver and DeHaven look gorgeous in Travilla gowns, along with singing and dancing beautifully. DeHaven also has some fun comedic moments and duets with Dennis Day. I'LL GET BY was directed by Richard Sale. It was shot in Technicolor and runs 83 minutes. It's a remake of TIN PAN ALLEY (1940) which starred Alice Faye, Betty Grable, John Payne, and Jack Oakie. This would be a great candidate for release in the Fox Marquee Musicals DVD series. In the meantime, look for it to show up on cable on Fox Movie Channel.